Do board books contain BPA? Don’t run to your bookshelves and start throwing out board books just yet. I don’t have answers, but I want to share a concern that recently popped into my head while cleaning out my son’s bookcase. Could plastic-coated board books contain BPA? As I sorted through our collection of books, many of the favorite board books had teeth marks and corners chewed off from our teething days. I thought nothing as a new mom to pass my child a board book in the car and let him/her gnaw away at it. Now I wonder, what exactly is in that plastic coating? Board is specified by thickness and weight. “Gsm” (Grams/square meter) indicates weight, and “pt” (point) indicates thickness. Typical weights are in the 300 to 400 gsm range, with a 18 to 25 pt thickness. The material in white board may be referred to as “SBS” for solid bleached sulfate. The site continues to explain how board books are more expensive to manufacture but sell for less than a picture book, which only furthers my suspicions. Harmful chemicals often occur in cost-cutting situations. Polycarbonate plastic, which is clear and nearly shatter-proof, is used to make a variety of common products including baby and water bottles, sports equipment, medical and dental devices, dental fillings and sealants, eyeglass lenses, CDs and DVDs, and household electronics. Is it so farfetched that board books could be added to the list? In retrospect, all those chewed up board books in my children’s bookshelves were not a good idea. Even if board books do not contain BPA, and I would love some independent testing to verify, the plastic coating could not be good for young ones to ingest. 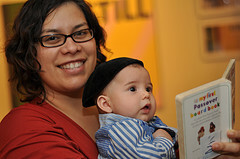 Since many young children enjoy tasting books as well as looking at them, the cardboard also helps the book stand up to biting, drool, and associated problems. The pages in a board book are usually coated with glossy material; parents who are concerned about toxicity may want to choose an environmentally friendly publisher. Good question, Jennifer! The plastic coating could be concerning, the pressed paper could pose a risk, and if they chew through, the inks could pose an additional risk. Oy! Cardboard books are great for looking at and sturdy enough to handle tossing and gripping by little ones, but they are not intended to be used as teething toys (or necessarily mouthed at all). I’ve never looked into the specific chemical risks, but I’m sure if we start digging, we’ll find some. I never intended to use board books as a teething toy, but it sort of happened at times. As you know, kids at the oral stage explore everything in their world through their mouths. In retrospect, I would have kept the board books out of reach without out close supervision or only used ones that I knew were safe. Janelle, have you heard of board books from environmentally friendly publishers as mentioned in the Wisegeek quote? I haven’t looked around. I worry more about the heavy metals in the inks than I do about possible BPA. That and the fact that most cardboard is recycled and contains by products from previous use. Plus the chemicals to bleach it into whiteness. RESULTS: BPA was leached from all books when pieces of them were dipped both into saliva and water for 20 hrs. The highest concentration of BPA leaching from one out of 10 books was 43.4 ng/ml (for 2 hrs) in saliva, which was estimated to be approximately 0.052 mg/kg body weight/day for infants aged 6-10 months. CONCLUSION: As BPA has endocrine-disrupting effects and poses higher risks in infants than in adults, it is desired to reduce BPA use in the printing of infant books from the viewpoint of child health. Suddenly, we have children’s books (and maybe other books soon) with pages that resemble vinyl or plastic much more than paper. Every book like this that I’ve seen, so far, comes from China. Print ink and media seems to be a totally unregulated market and there is no information about it in the books themselves. Also, in general, I also worry that “recycled paper” is slowly becoming a potpurri of recycled plastics of unknown origin. We are starting to learn that breathing vapors or ingesting small amounts of BPA can be harmful. I am not aware of any regulation that requires book or magazine publishers to know or reveal what their “paper” contains or what its content is.